I don’t follow golf. However, I would be remiss if I didn’t note Tiger Woods’ Masters win this past weekend. For what it’s worth, in my opinion his winning a major tournament after such a long “drought” and given his long period of trials and tribulations, much of which was self-inflicted, is amazing and may be prima facie evidence that he is the greatest golfer of all time. The Tiger has been called the Poor Man’s Cobra because it is a car of similar concept, but not pitched at the same level. Carroll Shelby played a role in designing the Tiger although not, perhaps, to the extent of his role in designing the Cobra. 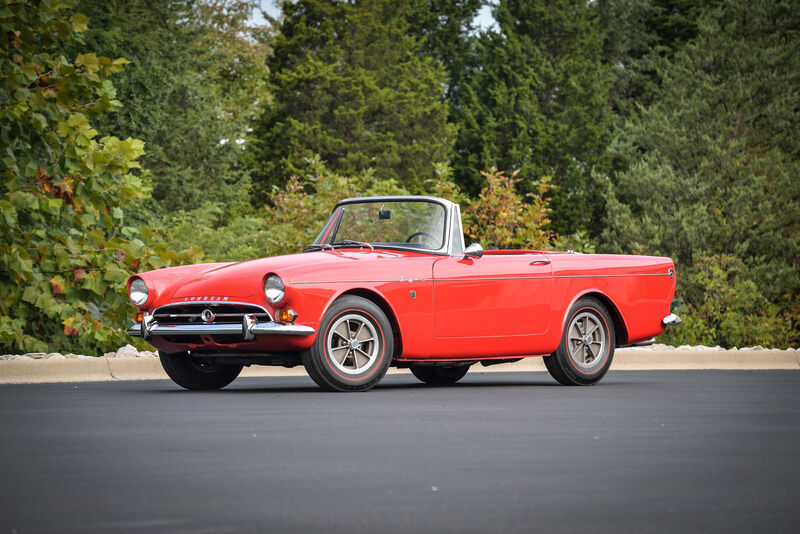 The Tiger was a higher performance version of the British Sunbeam Alpine and was produced from 1964 to 1967. The builder was the British company Rootes. The first version, the Mark I, was the majority of Tiger production and came from the factory with the Ford 260 cubic-inch V-8 rated at 164 HP/258 LB-FT of torque. If that doesn’t sound like a lot of output remember that this car had a tiny 86-inch wheelbase and weighed about 2,600 pounds. It was also possible to buy a higher-output engine which would have been installed by the dealer. In its first year of production virtually all Tigers were exported to North America. In an effort to appeal to American buyers the car was fitted with “Powered by Ford 260” badges on each front fender beneath the Tiger logo. The Mark II was powered by the famous Ford 289 cubic-inch V-8. I have seen the output of the engine used in the Tiger listed at 200 HP/282 LB-FT. I thought the 289 had 195 HP with a two-barrel carburetor and 210 HP with a four-barrel. The discrepancy is not really a big deal. Maybe Professor Kraman can help us out here. Chrysler purchased Rootes in 1967, didn’t want to use a Ford engine in its products and didn’t have a suitably sized V-8 of its own. That was the end of the Tiger after about 7,000 were produced. Anyone reading have any familiarity with these cars? I would very much like to read about your experiences. Yes, I have experience with the Sunbeam Tiger! I watched Get Smart as a kid! Ha, ha! The infamous Zal here. I’ll try to keep my personal feelings for Tiger Woods (let’s say they’re not very positive) out of this and stick to the issue at hand. Pretty even, wouldn’t you say. One could argue that the level of competition is higher during Tiger’s era than it was during Jack’s, but that is not clear. Most would argue that the depth of competition these days (numbers 21-100 in the world or on the PGA tour) is likely better than it was during the 60s, 70s and early 80s. But Jack competed head-to-head with several all-time greats in their primes (Palmer/Player/Watson) and sever other multiple major winners and Hall of Famers (Julius Boros, Hale Irwin, Tom Kite, Johnny Miller, and others). Tiger has certainly faced some stiff competition, but their places in the HOF discussion is still TBD. Because their career records are so close, I will split it this way (as Bill James has sometimes argued). I believe Tiger’s peak performance (winning 6 of 9 majors, one by 15 shots and another by 8 shots), was the most dominant performance in the history of golf. For a total career, I would have to choose Jack, a few more majors and significantly better record in majors overall. Where does that leave me? Not certain, but if forced to choose, I would give Nicklaus a slim edge at this moment. . Tiger is certainly no worse than #2 all-time, and could reasonably be argued to moderate to be the greatest ever. Another major or 2 would probably seal the deal. Dr. Zal! We are honored by your presence. Your knowledge of golf is infinitely greater than mine so I will defer to you.